Double Bell with Traditional Holly and Bow Rope Light Display. 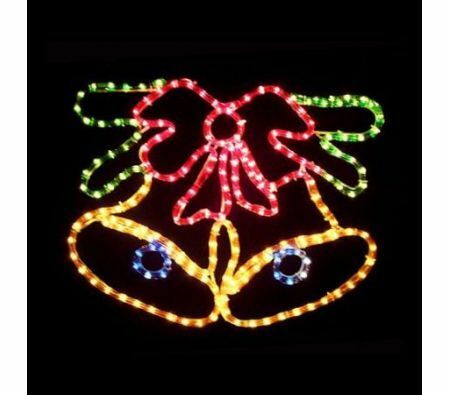 Welcome in the festive cheer with this stunning Christmas Bell Rope Light Display! This lovely Christmas light display features a colourful Double Bell complete with traditional Holly and a lovely big red ribbon bow to set the mood. Get ready to turn your house into the most dazzling house on the block! This Christmas Light features a solid sturdy frame and thick durable rope light so you can place it wherever you like - place it outdoors in your garden or indoors to add a truly festive cheer to your home today! 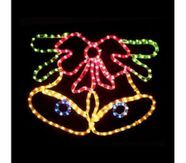 With the variety of bright colours, this rope light decoration will surely bring warmth to any christmas night. Celebrate the festive spirit in your home this holiday season, hassle free as there are no assembly required.